Everton remain unbeaten since Sam Allardyce was hired after a 0-0 draw with Antonio Conte's Chelsea at Goodison Park. Here, Press Association Sport assesses how both managers fared in the stalemate. Allardyce replaced his centre-back pairing in the Premier League for the first time since arriving, bringing in Michael Keane and Phil Jagielka for Ashley Williams and Mason Holgate. Perhaps he felt more comfortable doing so given he was facing a Chelsea side without a recognised striker as Conte once again deployed Eden Hazard as a spearhead in the absence of the suspended Alvaro Morata. Conte, known for his reluctance to rotate too much, made just one change from the Blues' last Premier League game, switching Gary Cahill for Antonio Rudiger. The hosts were pinned back frequently in the opening period, leaving Dominic Calvert-Lewin as an isolated outlet against three Chelsea centre-backs. Allardyce tried to stop that by making a double change at the break and going to three at the back and offering Calvert-Lewin an attacking accomplice in Sandro Ramirez. For all Chelsea's ball retention, they struggled to break down the Toffees without their top scorer and a suitable focal point as Hazard naturally drifted wider and deeper. As was the case at Anfield earlier this month, Allardyce reacted to a flat first half with two substitutions at the break. The introduction of Williams saw Everton change formation while Sandro's arrival allowed Gylfi Sigurdsson to revert to a more central berth. What Allardyce had not been banking on was an injury to Idrissa Gana Gueye within six second-half minutes which forced him to use his third and final change with just under 40 minutes to go. 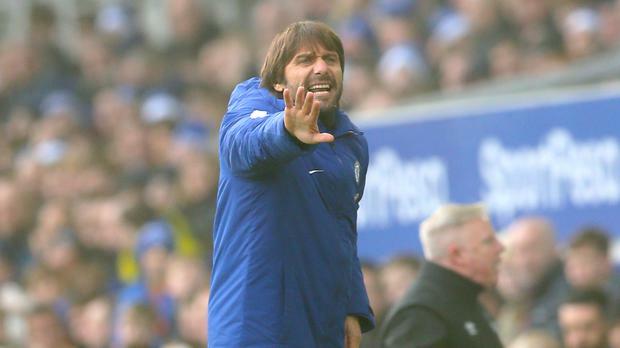 Conte looked to inject some more guile into his ranks by replacing Pedro with Cesc Fabregas, and then the Italian quickly called for Michy Batshuayi, yet neither was able to make a decisive impact. Allardyce will have been the happier of the two managers and this was the epitome of the grit and steel he has brought to Everton in his short time at the club. The fans will surely demand more expansive, attacking football - they failed to register a single shot on target here - but the Toffees now have a solid base to grind out results against the division's best. The Blues were impressive on the ball with plenty of quick, short passing, but there was no thrust or end product. Conte must look to address what already appears to be an over-reliance on Morata.